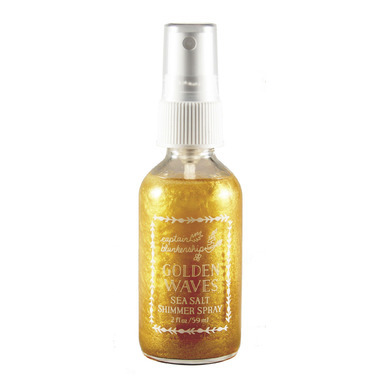 The original Captain Blankenship Mermaid Sea Salt Hair Spray gets golden! It's the same classic organic Sea Salt Hair Spray formula but with added natural gold mica for beautiful shimmer. This golden magic works well on all hair colors, adding life, shine, and strength to your tresses. Stroll through a sunbeam and watch your organic glam make heads turn! How to use: Spray generously throughout your damp or dry hair, from roots to ends, scrunch with your fingers and style. Natural separation of mica will occur, shake well before use. Works well on damp hair to give you soft waves like when youâ€™re on a beach vacation and have been in the salt spray. I like the subtle shimmer, as I have very fair blonde hair. Scent is pleasantly different, beachy and organic. My new fav. Has a Str0nGer CiTrusY~ish ScenT than ExpecTeD! Absolutely loved it ! My new favourite sea salt spray !